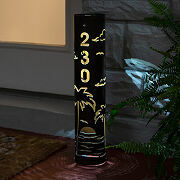 Turn your walkway into a little piece of paradise with this artful solar house sign. By day, it soaks up the sun. At night, it gets to work: Lighting your way after a long day, or welcoming guests to one of your well-loved dinner parties. Chris Crooks crafts each one from sturdy steel, incorporating a bright solar LED light that can also be plugged in for a charge. Choose from three designs (beach, lake, or grass and fireflies) and three hand-painted, weather-resistant colors (rust, green, or white). Energy-efficient and enchanting? That's our kinda design. Includes a stake so it stays put. Handmade in Tucson, Arizona.